IFA used to be dominated by smartphone announcements, then tablets moved in and now wearables are the new hotness. Many companies have various smartbands but we’re only interested in proper smartwatches – ones with big screens for notifications and with a proper OS to run apps. This cuts the number of contestants down somewhat but not enough, it can still take you a while to wade through specs and price not to mention looks. There’s a battle shaping up versus practical square watches and aesthetically pleasing round watches. Here are all the specs in one place to make things a little easier. The table mostly speaks for itself but it does need some clarifications. For one, Android Wear recently added support for GPS but it’s not clear if all devices have a built-in receiver. Sony has confirmed the SmartWatch 3 does have GPS and the Samsung Gear S has GPS and standalone navigation courtesy of Nokia HERE Maps. The Gear S is the only Tizen-running watch in this comparison but it’s also the most independent – with a SIM card slot and 3G connectivity it can be used without being connected to a phone. The Gear S also has an IR blaster, which the others lack. The same Android Wear update allowed some freedom for the watches – they can talk to accessories, like Bluetooth headphones. This means you can go on a run and listen to music from the watch, which is where the built-in storage comes in. Here’s a quick refresher on IP ratings as that’s much more important for a watch than a phone. The first digit signifies dust tightness – 5 means dust can only cause cosmetic damage, 6 means the device is completely dust tight. The second digit is water resistance – 5 means water jet resistance, 7 means submersion up to 1m of water for half an hour and 8 goes beyond that (generally up to 3m but may vary). 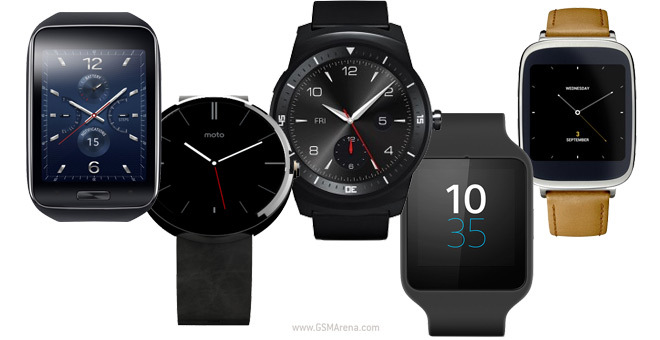 So, which one is your favorite smartwatch of this IFA?